$295.99 plus free shipping in the contiguous US. Call for Hawaii and Alaska prices. Volume discounts and dealer pricing available. Whether for everyday or emergency use, today’s vehicles are loaded with more electronics than would have been imaginable just a few years ago. 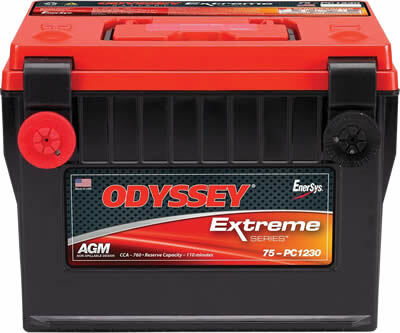 ODYSSEY batteries have been designed to keep up with the changes. Because their plates are made of pure virgin lead (unlike the lead alloy in most batteries), we can pack in more plates. And more plates mean more plate surface area, and much more power — twice the overall power and three times the life of conventional batteries — up to 400 cycles at 80% depth of discharge! ODYSSEY batteries deliver the massive starting power, rapid recovery, and amazing deep cycling capability that today’s vehicles demand. Copyright © 2019 - Text, graphics, and HTML code are property of West Coast Batteries and are protected by US and International Copyright Laws, and may not be copied, reprinted or otherwise distributed by any means without explicit permission. Odyssey is a registered trademark of Enersys Energy Products Inc.